Why compromise when you could own this ranch style home that features 3,500 Sq. Ft. of living in quality. Look inside and you will be surprised by sunlit rooms and spacious living room with French doors leading to an office/den area. The kitchen is all decked out with newer appliances, new granite and glass tile backsplash, also offering large island, pantry and nice dining area. The main level has all the features you need like laundry, half bath off the garage, Master suite with walk in shower,whirlpool tub, and 2 sinks. The home offers 3 additional bedrooms and 2 full baths. The basement has a spacious family room with gas fireplace opens to a separate area considered a rec/room for pool table or just extra living space. The 2 bedrooms in the lower level are oversized and offer walk in closets. 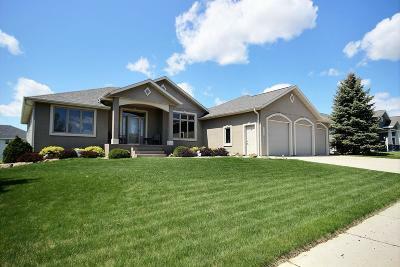 You will also enjoy the amount of storage that this home offers in the mechanical room. The garage is a extra deep triple that offers water, workbench, cabinets, heater, and floor drain. Don't miss this one, call today!